Finance Costs > How Much Do Movie Tickets Cost? Of course, a movie ticket is needed if you want to go to the theater and enjoy a movie. This movie ticket can be purchased at the box office that is located at the movie theater, but it can also be purchased through the website of the theater or a third-party website and then printed out. On average, a movie theater ticket is going to range anywhere from $5 for a daily matinee to as much as $20 for an IMAX. Standard movie tickets are going to cost $6 to $13 and will cost the most on weekends and all days after 5 p.m.
An IMAX in 3D can cost the most at $8 to $20. A 3D movie, for example, can cost $12 to $17. These prices really boil down to your geographical location. According to Hollywoodreporter.com, the average cost of a movie ticket is $8.12. According to the National Association of Theatre Owners as posted in the Los Angeles Times, the average ticket price for the three-month period ended September 30, 2012, was $7.78, down from a record high of $8.12 in the second quarter and $7.94 a year earlier. On a forum thread on the City-Data.com, forum members stated that they paid anywhere from $5 for an afternoon showing to as much as $12 for a night show on the weekend. NOTE: These prices may be lower during the afternoon or on certain weekdays. The cost of a movie ticket depends on which movie theater you want to attend. Some movie theaters are much more expensive than others. The location of the theater also matters because the price of theaters which are far away from the city might be cheaper. Sometimes movie title matters because a movie theater bases its price on the popularity of a certain movie. 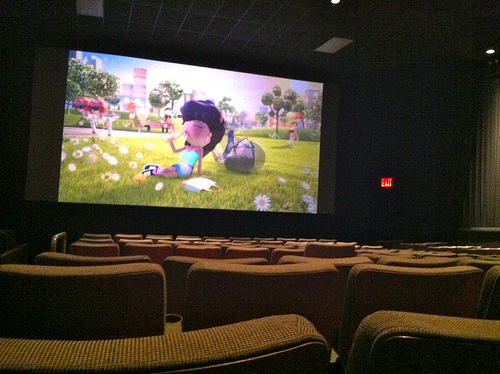 Today, movies can come in 3D, be shown in IMAX or through the traditional screen. The type of movie can affect the price. Movies during the day on a weekday are going to be cheaper than those at night on a weekend. Free tickets are sometimes available. Check with your local theater to see if they are offering any type of promotions. Sometimes you may find them showing older movies for next to nothing. If you are purchasing tickets for a large group of people, ask the theater manager if they offer any type of group discount. Many movie theaters offer frequent movie goer club cards. The more times you head to the theater, the more you can save in the future. You can also receive free food, t-shirts, etc. If you can, go to the movie during the weekdays and take advantage of the matinee pricing. Most major chains offer discounts to children, military members and senior citizens. Third party websites, such as Fandango, often have coupon codes readily available online. If using this type of service, search for any active coupon codes before making a purchase.